Finally able to get back in the shop!!! Been feeling a bit better lately, and have been able to work a little in the shop. With this autoimmune stuff, I just have to learn how to listen to my body.....and take breaks before I over do it....otherwise I end up...balled up on the couch for the rest of the day. Some of you might remember that about 5 months ago, I purchased this 509lb Peter-Wright. Over the past couple of days I've gotten the face polished up, and ready to work on. There are still a few deep dings that I just couldn't get out.....but NOW she's ready to work on. 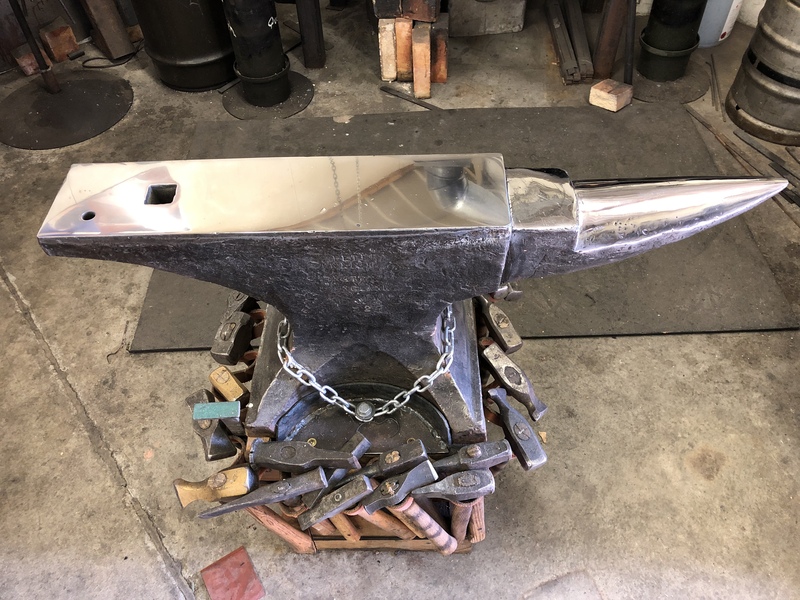 If you think it's insane to polish the face of an anvil.... remember that EVERYTHING you forge beings on the anvil..... if it's isn't "right", then the rest of process is just more difficult. 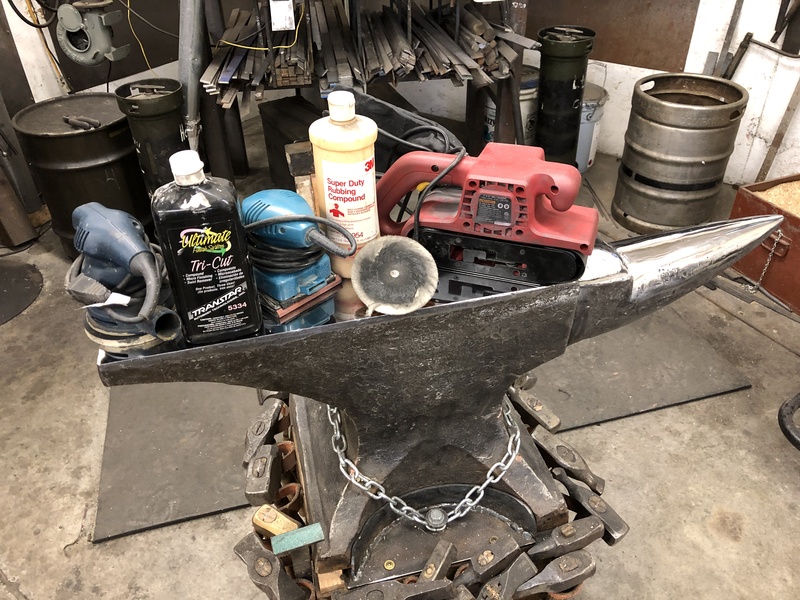 I had some folks request pic of the tools I used..... so here they are (what isn't in the pic is a pile of 3x21 belts, and a stack of wet/dry sheets. Whoa! Nice job cleaning that up! Hey Ed, looks like the next project is to make a new batch of hardy tools, that hardy hole looks huge! I saw your temperature forecast for the coming week, good luck getting that pump motor started. Great to hear you're out in the shop. That is my dream anvil Ed, I am happy for you. Hi Craig! And the darn furnace in the finish shop is broken down. The induced draft blower went out, and even though I ordered the parts a week ago, they won't be here until Tuesday.....just in time for the thing to warm up. 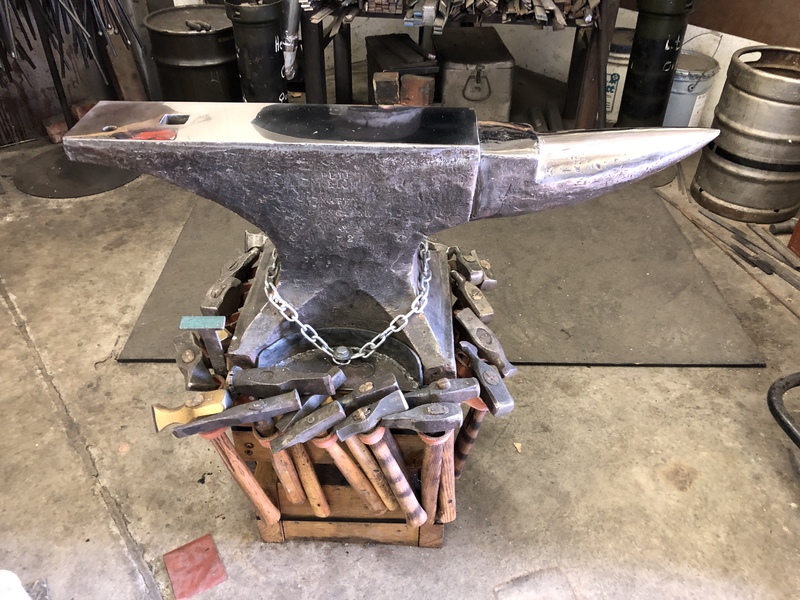 I paid dearly for working on the anvil! I ended up on the couch most of yesterday. Wish they'd get me figured out enough to let me function. Pretty frustrating. As a fellow sufferer of undiagnosed “auto-immune” disease, I have the same issue. I read an article once, and they compared “chores” or “jobs” to spoons in a jar (no clue why they used spoons). Every day you have s limited number of spoons in each jar, which represents how much you can do in a day, without having an adverse affect on the next day(s). If you run out of spoons on any given day, and continue to work, you effectively remove 2 spoons per job from the next day as well as one each from the following 2days. I don’t know if that analogy makes any sense, but it works for me. I have had to come to terms with abbreviated work sessions, and trying to maximize my efficiency. It works for me. Prayers and fingers crossed for you my friend. Maybe next time they will start DOING MEDICINE, instead of PRACTICING MEDICINE! LOL!!! I understand Kev! For me it's just so frustrating. I think it's because NOTHING is predictable anymore. Some days I can get away with doing a few things, and like you said..... if I do just a tad too much, I'm hosed the next day. Even going to bed at night is a crapshoot. Sometimes I can fall asleep fairly quickly, and sleep 5-6 hours. Other nights, when pain flares, I lay there for literally hours trying to fall asleep.... and then when I do, I MIGHT get an hour or two before waking up, and being in the same pattern again. When that happens, I'm so fatigued the next day that I can't do much of anything. I'm just now learning the signs my body gives me to "slow down" or "take a break". Again, it's frustrating..... I've been so used to working daylight to dark, for so many years, that I feel like I'm not getting anything done. I'd at least like to get back to the point of things being predictable enough that I could start booking Bladesmithing Classes again..... but right now I'm not sure it that'll happen. I have three different Doc appts over the next two weeks.... and have to admit that I'm a bit surprised, but in a good way, the all the Doctors involved (5 of them) are communicating, and a couple of even arguing over what should be done. The one that seems to be digging the deepest is the Pulmonologist.... but he's wanting to put me on a drug that is used on Lupus patients, but it's major side effect is a fairly high probability of lymphoma...... to me that's almost a case of the cure being worse than the illness! One of my biggest concerns right now is that this autoimmune falls squarely in the speciality of a Rheumatologist....... and they are VERY scarce here..... in fact there are only 11 in the entire state of Montana! It took me, and my Primary Doc 4 months, to find a Rheumatologist that would accept a new patient. This Doctor flies in from Vegas, to Great Falls, for one week a month. I've seen her once, and I get the impression that she is just checking boxes, and doing her time here, until she can go somewhere else. I see her one more time in March, and then she's done here..... not sure what's going to happen then..... my Primary Doc and his staff are already looking for a Rheumatologist who will accept new patients.....but no luck yet. We actually do have ONE full time Rheumatologist here in Great Falls, but he has 3200 patients, and is not accepting any new ones. Ed that is really crazy! I couldn't even imagine the frustration of what you are going threw. I pray for the best for you. WOW!! 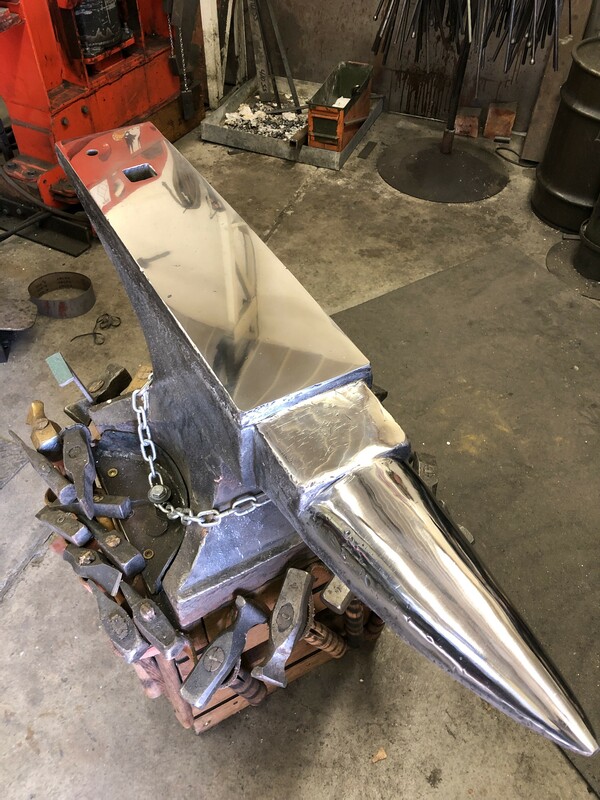 Whos the new kid with the Chrome Plated Anvil!! LOL!! Glad to hear your back in the shop!